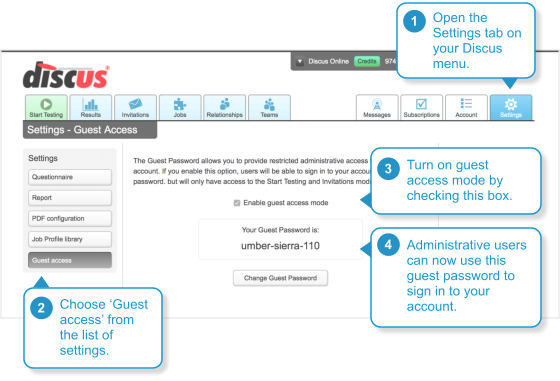 Now you can set up guest access to your account restricted to Discus' administrative features. It's often the case that your administrative staff will be handling the setting up and delivery of Discus profile tests, but you won't always want administrators to have full access to all of Discus' features. We've added a feature to address just this situation: the new Guest Access feature lets you set up a limited level of access to your Discus account. In the Settings tab of your Discus account, you'll now find a new 'Access Control' option. In that section you'll see an automatically-generated password that can be used to sign in to your account in place of your normal Discus password. Signing in with this Guest Password opens up Discus with its features limited to just those needed to set up a Discus invitation or to run a test directly. Guest users do not have access to other Discus features like candidate results or credit purchasing. This new feature does not affect your normal Discus account in any way. It's an optional extra level of access control giving you a finer level of control over the use of your Discus account.